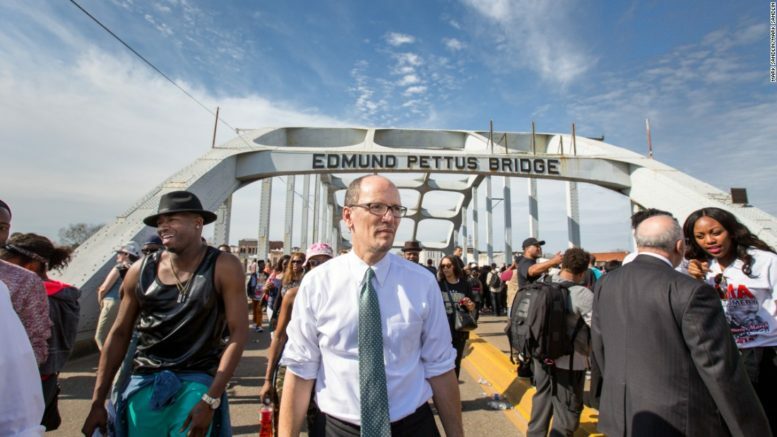 Tom Perez on Edmund Pettus Bridge on the 50th Anniversary of the “Bloody Sunday” March from Selma to Montgomery (CNN). While running for Chairman of the Democratic National Committee, Tom Perez pledged to eliminate unpaid internships at DNC. However, it’s been nearly four months since Tom Perez became chairman, and now the DNC— under Perez’s watch—is employing another set of unpaid summer interns and is currently accepting applications for unpaid internships for the fall. According to the DNC’s website, unpaid interns are required to work 40 hours per week, leaving little time for interns to work part-time jobs to pay their bills. It’s unclear if the internships meet the U.S. Department of Labor criteria that determine whether the internships financially benefit the employer. The DOL’s six point test is intended to clarify whether unpaid or educational arrangements are truly beneficial to the intern, and whether or not interns must be paid at least a minimum wage. When pressed by Payday Report to explain why they had yet to implement Perez’s pledge, the DNC said that they are still exploring ways to find the means to pay them. The DNC’s failure to start paying its interns has angered even those who worked closely with Perez during his tenure as Secretary of Labor under President Barack Obama. The continued efforts of the DNC to recruit unpaid interns underscores a heated debate within the DNC on how much the party pays its top consultants. Currently, the DNC does not publicly release its budget, and not even the elected Democratic National Committee members are allowed to see it. “If the DNC members and the executives are fundraising for the party, they should know where that money is going and know that it’s being allocated properly,” says former DNC member Nomiki Konst, who was picked by Senator Bernie Sanders (I-VT) to sit on the DNC’s Unity and Reform Commission, which aims to mend divisions between Sanders and Clinton supporters. Konst has helped lead an effort to get the DNC to publish its budget and allow participatory budgeting from its 447 elected Democratic National Committee members. The DNC did not respond directly about whether or not Perez supports making the budget of the DNC transparent. “We’re in the middle of restructuring the DNC, and that includes a top-to-bottom review of all of our spending and finances,” says DNC spokesperson Michael Tyler. If Perez resists calls to make the budget public, it would be a role reversal for the former Secretary of Labor. As Secretary of Labor, Perez enforced the Labor-Management Reporting and Disclosure Act, which requires both unions and employers to file annual reports online detailing their expenditures on union activity. Mike Elk is a member of the Washington-Baltimore NewsGuild and is the senior labor reporter at Payday Report. He previously served as senior labor reporter at POLITICO and has written for the New York Times. He also writes for The Guardian.